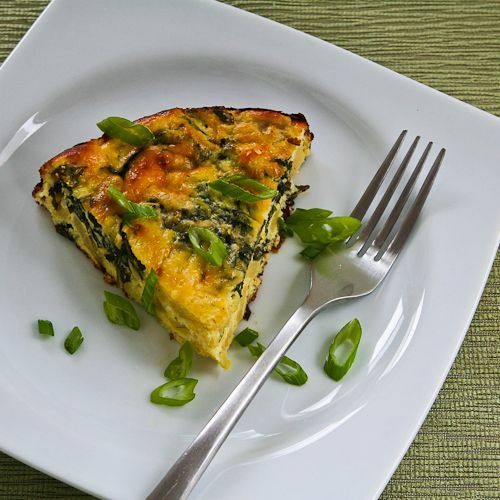 This delicious Low-Carb Artichoke, Kale, and Ricotta Pie with Eggs and Parmesan would make an elegant dish for any time of day, and this amazing meatless dish with special flavors is low-carb, Keto, low-glycemic, and gluten-free! Use the Diet-Type Index to find more recipes like this one. Click here to PIN this Low-Carb Artichoke, Kale, and Ricotta Pie! How do you feel about kale? Truthfully it’s something I hadn’t eaten much until a few years ago when I started growing Red Russian Kale in my garden. That sweeter and less bitter red kale turned me into a kale convert, and for years I grew both Red Russian Kale and regular dark curly kale. Growing kale is so much fun; I loved snipping a few leaves off the kale and cooking with them. I tried this Artichoke, Kale, and Ricotta Pie when I also had half a container of ricotta in the fridge left from something yummy, and when I searched for recipes to use ricotta and kale, I found this interesting recipe for Artichoke, Kale, and Ricotta Pie from The Kitchn. I don’t think I’ve ever used ricotta in a baked egg dish like this, and it added a creaminess that was really nice. I used a generous amount of kale, part-skim ricotta, a little less Parmesan, and a few more eggs to lighten up the dish. This pie would be lovely to serve for an elegant brunch, but actually this would work for a meal any time of the day. You can see why it’s called RED Russian Kale. If you pick the small tender leaves, they’re even good raw in salads. I always wash garden greens well in the salad spinner. You could make this in any kind of round pan, but I used a springform pan which made it easy to remove the pie. Spray well with olive oil. After the kale is washed and dried, coarsely chop with a chef’s knife. The recipe didn’t call for this, but I heated a tiny bit of oil and wilted the kale. (This only takes a minute or two over high heat.) Combine the beaten eggs, ricotta, Parmesan, salt, and pepper. Put the kale in the pan, and top with the chopped artichoke hearts. Pour the egg mixture over the veggies. (I topped it with about 2 tablespoons of freshly grated Parmesan.) Bake about 40 minutes, until the eggs are well set and the pie is starting to lightly brown. Serve hot and enjoy! This delicious Low-Carb Artichoke, Kale, and Ricotta Pie with Eggs and Parmesan would make an elegant dish for any time of day. Heat olive oil in a large frying pan, add kale and cook, turning a few times, just until it barely wilts. This will take not more than 1-2 minutes. Spray or rub the cake pan or springform pan with olive oil. Put kale in the bottom of the pan. Drain artichoke hearts, chop them, and layer on top of kale. Pour egg mixture over the kale and artichoke hearts, then use a fork to gently mix so the vegetables are evenly distributed in the eggs. Sprinkle a few tablespoons of freshly grated Parmesan on top if desired. Bake the pie until it’s set and lightly starting to brown, about 40 minutes. Let cool a few minutes, then slice and serve. Recipe adapted from Artichoke, Kale, and Ricotta Pie from The Kitchn. This Artichoke, Kale, and Ricotta Pie has low-carb ingredients like eggs, kale, and artichoke hearts, ricotta, and Parmesan, so it would be great for the South Beach Diet or other low-carb diet plans. If you’re limiting fat for the South Beach diet, this is probably a “once-in-a-while” treat due to the amount of Parmesan. Vivzilla, so glad you enjoyed it!